AMD’s Trinity is finally here, and the first question on everyone’s mind is what is launching. The answer to that, for today anyway, is five mobile CPUs including a new high end A10 line. The silicon specs are not that much of a mystery, SemiAccurate exclusively published a die shot in January, and the logos and name a month before that. Today we get official confirmation of the things we mentioned months ago, with the launch of two A10 CPUs, one A8, and two A6’s, all based on the new Trinity core. The parts out today are all built on the GlobalFoundries 32nm SOI process that Llano and Bulldozer are, with yields said to be very good, well above Llano. Mobile parts with three wattages, 35, 25 and 17, all launch today, the 65 and 100W desktop variants coming later. The Trinity die itself has two Piledriver modules, that means four integer cores in total. Each one is an ‘enhanced’ version of the Bulldozer architecture, with lots and lots of little updates that add up to a serious performance gain. That gain is not taken in the form of high clocks and single threaded speed, but in lower power for the same performance as the older variants. This is basically AMD’s way of saying current levels of CPU performance are more than fine for the mainstream, but GPU performance is not. For the buyer, that means energy use has been dramatically cut, so Trinity is almost twice the performance per watt of the older Llano CPU. That is why the mobile Trinitys come in 17, 25, and 35W versions, the older Llano had only 35 and 45W versions. Since AMD says Trinity has twice the performance per watt of Llano, a 17W Trinity should perform on par with a 35W Llano. Until someone tests a 17W Trinity in the wild, we won’t know for sure, but that sure sounds like a good thing on paper. The models that are out today are the A10-4600M, A8-4500M, A6-4400M, A10-4655M, and A6-4455M. The first three are 35W, the 4655M is 25W, and the 4455M is 17W. A6’s are two cores, A8 and A10 models are four cores, and the lower wattages get LV and ULV tags for good measure. Base clocks range from 1.9 to 2.3GHz, and max turbo frequencies go from 2.6 to 3.2GHz. Similarly, shader counts come in three variants, 192, 256, and 384, basically three, four, and six VLIW4 64-shader arrays. Clocks on those range from 327-497MHz base and from 424-686MHz turbo. 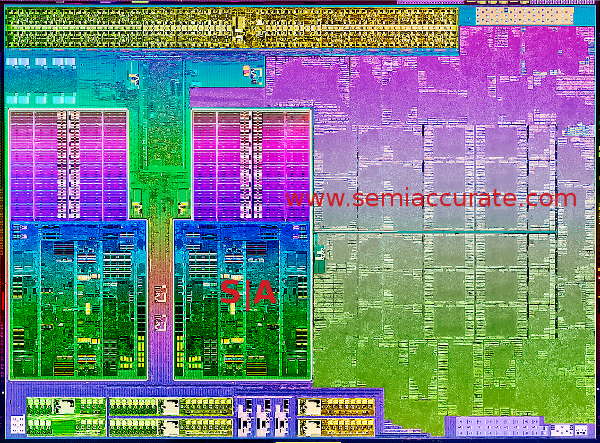 One part we wish AMD would have put out is a 2C 384 shader part at ‘full’ clocks in the 25W range. Back of the envelope math says it should be more than doable, and that would be the sweet spot for most users. Maybe in the next revision. All of the 35W parts use socket FS1r2 a 722-pin lidless µPGA CPU in a 35*35mm package while the lower wattage versions use socket FP2, an 827-pin 27*31mm lidless µBGA. In case you aren’t up on all the latest CPU packaging minutia, FS1r2 is a socketed part, FP2 is a soldered down version, about what you would expect for an ultrathin CPU. All of the Trinitys are currently made from the same die, a 246mm^2 CPU with 1.303 billion transistors. If you are a large enough OEM, you can specify chocolate, vanilla, or strawberry TIM material, but end users have to chance it when you purchase a laptop. Just kidding, but if you made it through all of this, congratulations.